Michael Birmingham rates Horndean’s Wessex Premier derby against Baffins Milton Rovers at Five Heads Park as their toughest game of the season. The Reds boss even suggests Saturday’s visitors will start as favourites. Horndean currently sit third in the table, with four wins and two loses from their six league games to date. Baffins are eighth, with eight points from five games. 'If you look at results from the end of last season and the start of this, Baffins are one of the form teams,’ said Birmingham. 'They have a lot of quality players and the best manager in the league. 'Baffins have come a long way in a short space of time and are a club going places. 'Within three years I believe they will be the biggest local club in the area. 'They have to be serious contenders and are always a very difficult side to beat. Baffins boss Steve Leigh is predicting a close-fought tight affair. 'This game can go either one of two ways,' said Leigh. 'It has the potential to be a mouthwatering game because of all the quality players involved. 'The two teams know each other so well, though there is a danger they could cancel each other out. 'There is a lot of respect between the two clubs and management teams. 'Horndean have set the standard locally for the last few years, finishing highest of all the local teams. 'We aspire to get where they are. 'They are well established at this level and we will need to be at our best. League leaders AFC Portchester are involved in a top-of-the-table clash at Sholing. Joint-manager Mick Catlin reckons tests won't come any tougher for the Royals. 'Sholing will be the team to beat and catch this season,' said Catlin. 'After this we should have a better idea about if we are contenders or not. Jake Morgan is serving the final game of his suspension. 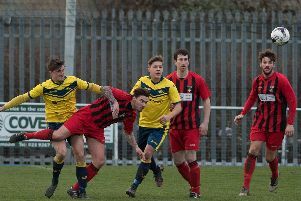 Fareham Town host Hamble Club at Cams Alders. The Reds are looking to bounce back from their 9-0 League Cup defeat against Cowes Sports.